Ramsons (Allium ursinum) is known as "Bärlauch" in German and is a wild relative of chives. The Latin and German names for it refer to brown bears who liked to dig up the plant and eat it in the spring. Ramsons are one of the first spring greens, emerging from storage bulbs in February and March and are harvested at that time. Harvest ends when the plant starts to bloom, April through June. Ramsons smell strongly of garlic and it is hard to miss it when biking or walking through a patch of this plant in the parks in Germany. The taste is a cross between onions and garlic. Visually, it can be mistaken for Lily of the Valley, Convallaria majalis or "Maiglöckchen", which are poisonous but have a scent used in many perfumes - definitely not a garlic scent. Evidence of people and livestock eating ramsons in Denmark and Switzerland has been found dating back to 9000 BCE and more. The use of ramsons has reemerged in recent years due to an interest in traditional foods. Bärlauch cream soup and pesto are common dishes in Germany. In North America, ramps (Allium tricoccum) is a close match to European ramsons. It is commonly found in Appalachian cuisine and Canada's Quebec Province. Also known as spring onion, ramson, wild leek, and ail des bois. In Richwood, West Virginia a festival is held every year celebrating the spring delicacy. Substitutions for ramsons could be a mix of any or all: garlic, chives, and onion or spring onion. Because the wide, triangular leaves are used, some spinach cut into ribbons (chiffonade) would help the final visual product. 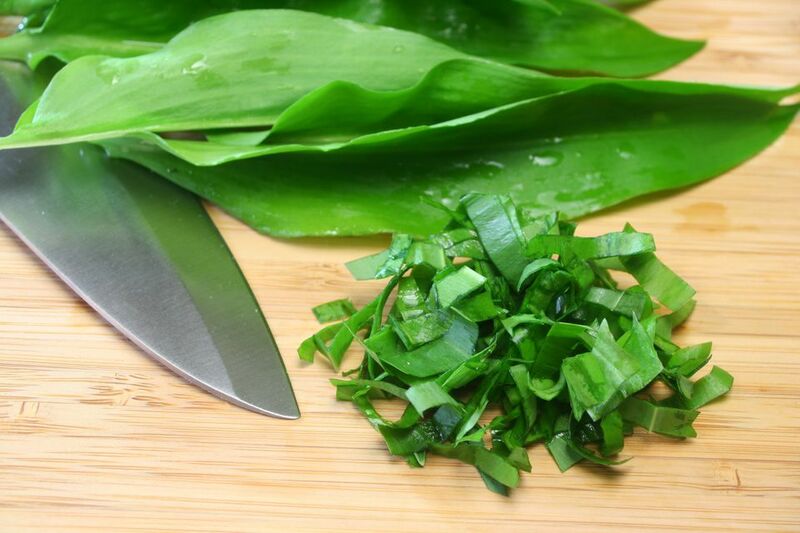 In folk medicine, ramsons are seen as cleaning the stomach, intestine, and blood.